The Skidmore College Social Norms Campaign is a health awareness movement designed to deliver the truth about substance use among students in our Skidmore community. Did you know that most of you are making responsible and healthy decisions? Research shows that people often overestimate negative behaviors and underestimate the positive, protective behaviors of their peers. If an individual believes that a majority of their peers are partaking in a certain behavior, they are more likely to engage in that behavior themselves. The aim is to correct these misperceptions by providing accurate information to the community. 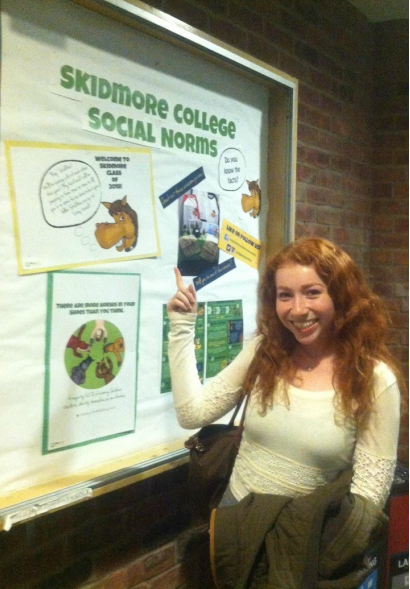 The Skidmore College Social Norms Campaign does just that! Skids and friends are working hard to give you the scoop on just how responsible and healthy you really are! Each month throughout the academic year features a healthy behavioral norm that you students self-identify as participating in. These messages will be highly visible throughout campus. You will also have the opportunity to engage in enjoyable, entertaining activities that show off your sensible decision-making skills and responsible choices. Many will even win awesome prizes! Keep up the awesomeness, Skiddies! Our goal is to empower students to continue to display healthy and responsible behaviors and contribute to building a campus community and culture that mirrors their true individual values and beliefs.